Kool Kat of the Week: We’re Off To See The Wizard Mark A. Harmon: There’s No Place Like the Fabulous Fox This Week! 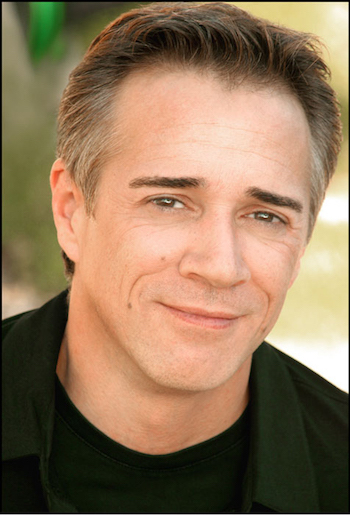 Mark A. Harmon plays Professor Marvel, aka the Wizard of Oz in the new musical adaptation this week at the Fox Theatre. There is little in American pop culture as universally, cross-generationally and continuously beloved as the 1939 film adaptation of THE WIZARD OF OZ. Everyone knows the characters, the songs, and why wicked witches don’t shower. 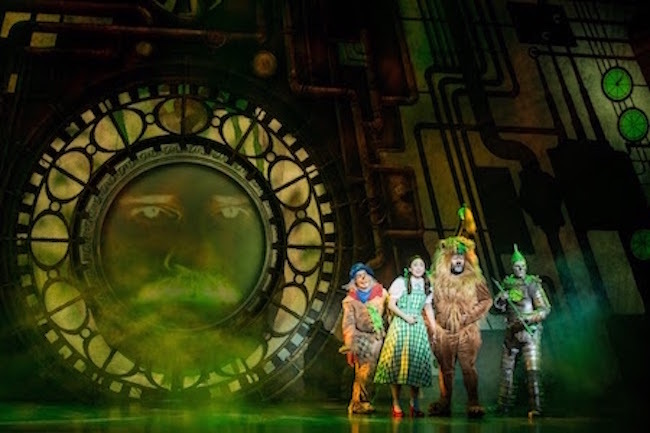 The national tour of stage musical THE WIZARD OF OZ, running June 21-26 at the Fabulous Fox Theatre, takes audiences arm-in-arm back down the Yellow Brick Road. Oz had already appeared on the big screen by the time Judy Garland went over the rainbow, including silent versions in 1910 and 1925, and a 1933 cartoon, as well as several stage versions (including one by author L. Frank Baum himself in 1902). However, it’s the MGM classic that became the definitive version immediately upon its release 77 years ago this summer. It was nominated for Best Picture (but lost to GONE WITH THE WIND) and won Oscars for Best Original Score and Best Original Song. The musical, which premiered in London in 2011, is based on the 1939 film, with all your favorite moments reimagined for the stage. That means Munchkins, flying monkeys, and dead witches! And what would Oz be without the vibrant Technicolor hues of the film—ruby slippers on yellow bricks to the Emerald City! Expect the same rainbow palate on stage. In addition to the classic songs, the production features new songs by musical theater legends Tim Rice and Andrew Lloyd Webber. The Wizard of Oz himself, Mark A. Harmon, took a few minutes last week to chat with ATLRetro. ATLRetro: I’d wager you’ve been an enormous fan of the 1939 MGM masterpiece your entire life, but I guess you don’t necessarily have to be. Why did you want to be in this production? Mark A. Harmon: Of course! I’ve been a huge fan! I remember as a child one of the major television networks would run it once a year I believe around Thanksgiving. It was always a major event that you waited for all year. I have to admit that when I was asked to audition I was a little hesitant at first. I thought “How can you possibly do a live version that could even come close to the beauty of the movie?” Then I saw some clips from the first national tour and was completely blown away! We’re seven months into the tour and I’m still amazed at the production quality of this show. 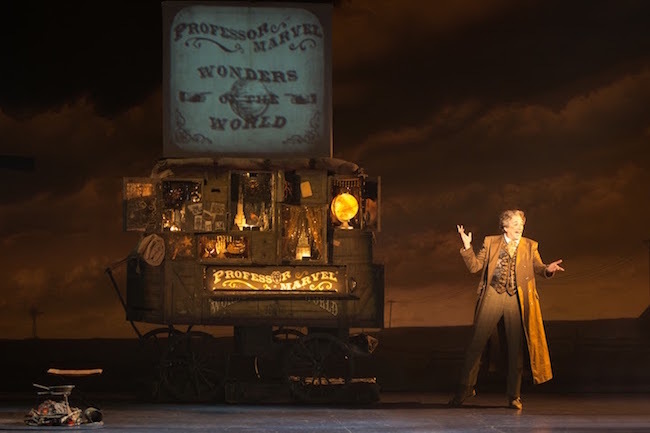 Professor Marvel brings his magical wagon to Kansas in THE WIZARD OF OZ stage adaptation. What new does this production bring to the story? The main story remains faithful to the movie and all the original songs are performed. There are new songs added by the brilliant Andrew Lloyd Webber and Tim Rice. One of them is “Wonders of the World” which is sung by yours truly as Professor Marvel. There have also been some changes to the dialogue. But rest assured, all your favorite lines are still there. As an actor, is it difficult preparing for such a famous role? It is a little daunting at first. There’s always the possibility of being compared to such a well known performance. But each actor brings a unique quality to their role. Even though the audience may have a familiar performance in their head, I believe they quickly start accepting you as that character. In addition to the 1939 film, there have been countless adaptations, interpretations, sequels and prequels to Baum’s original book (1900). What is it about the story that has kept inspiring revisits to Oz for over a century? I’m sure there are whole books devoted to answering that question. But for me personally, I think it’s one of the classic coming of age stories. What adolescent hasn’t felt misunderstood and wanted to run away? What’s it like on the road? Do you get to spend any time exploring the cities you visit? It depends entirely on the schedule. This is my third tour and I’m not going to lie, some can be downright grueling. I’ve done tours where we’ve played five or six cities in one week traveling by bus. I think it’s important for people to know that when you go see a touring show, especially one that is only playing one or two nights, that the actors may very well have spent anywhere up to eight hours on a bus that day. This one, however, has been without a doubt the most enjoyable mainly because of the fact that we’ve been playing each city for no less than a week. It’s been such a treat to be able to have the time to do some real exploring! Thanks again for chatting with ATLRetro. Break a leg! Anything else you want to mention? You’re very welcome and thank you. I’d just like to say that I’m so excited to be returning to the beautiful Fox Theatre and invite everyone, young and old, to come see this spectacular production of THE WIZARD OF OZ! The Wizard of Oz runs June 21-26 at The Fox Theatre. Show times and ticket information are available here. All photos are used with permission.